I don’t know if you saw the tragic news this morning but a Lutheran pastor in San Francisco was arrested for having many pornographic images of children on his computer. It is just unbelievable and it is sad. Massive wildfires, almost 900 people unaccounted for. And it seems to be a blessing that the rain has arrived… but there are flash flood warnings up north now because of the 4-6 inches of rain anticipated and no ground cover. A mass shooting at a synagogue in Pittsburgh and at a bar on college night down in Thousand Oaks. I am sure you could several more things to this list that you’ve seen in the news over the past couple of weeks. It would really easy to focus on the reasons not to be thankful. We could lament that life is coming apart at the seams. We may rank this as one of the worst years ever… but according to the Universities of Nottingham and Maine we aren’t even close. Can you imagine a year much worse? Well according to these researchers 536AD was the worst year ever for humans. That year had a massive volcano eruption which caused mass cooling. There were crop failures and famines. Then the bubonic plague… Black Death swept across the known world at that time. ¼ of the world’s population died. I can’t help but wonder… what did the Christians do in this time of great suffering? I do know that Saint Benedict lived through this time in the 6thcentury and he really was the first to establish monasteries. He began as hermit pulling away from everyday life but then established monasteries as a way to live communally and even serve within a community. In other words devotion to God did not wane in times of trouble. I am hopeful that we will be the church in whatever situation we might find ourselves—whether good or bad. I do believe that whatever we focus on is what we see. If we are to only look for the bad and talk about the bad—our minds will see mostly evil in the world. If we look for the good… we will see that too. That’s not to say we won’t see some bad stuff too… I am not a total Pollyanna. But where we choose to put our focus is what we will see most of the time. Do you remember what Mr. Rogers who was also a Methodist minister said about this topic? We also have the opportunity to be those helpers at different times. That seems to be one of the roles that Jesus took on whenever he was out in the world. Jesus was a first responder… actually he was their last resort. These men were desperate. They had been cut off from community, from family, from working from EVERYTHING. They had nothing. They had to live outside of town in case they were contagious. They didn’t have lives and were treated like they were less than human. Obviously rumors about Jesus had circulated through their families to them and so when they heard Jesus was coming through they probably knew this was their only chance. Everything else had failed them at this point. It was either Jesus or living in exile for the rest of their lives. As I said, they were desperate men. We know what happens next right? Jesus almost always says yes to these kind of requests. He freed them from their oppressed state.Now it was common practice to get the “all clear” from the Jewish priest (not Judas Priest the rock band) who was the expert on “clean” and “unclean” things. 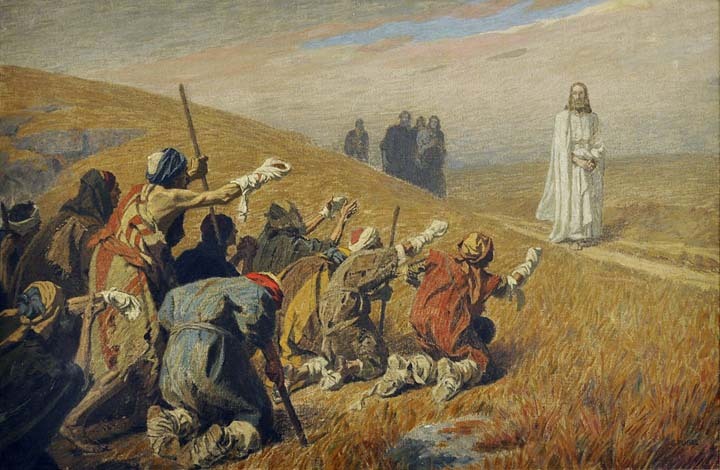 Jesus accepts his gratitude and that is the end of the story… there isn’t a chapter 2 when the 9 arrive to be examined by the priest only to discover that Jesus DID NOT heal them because of their lack of gratitude. But Jesus isn’t like that—even if we want him to be. I could do that but I am not. If this were Sunday School and we were going to act this story out… I wouldn’t want any of you to play the part of Jesus. I want us to all be lepers. All of us. It makes a lot more sense for us to be lepers. I know what you’re thinking… I don’t want to be a leper. Sure you do, you just don’t know it yet. Here is why we should be lepers… they are desperate. I think there is an important lesson to be learned in situations of desperation. Don’t forget this: desperation can lead to dependency. When you are at the end of what you can do… that is where God can step in. When we are trying to fix everything ourselves and be in control—there is no room for God to act. This problem is compounded by our comfort. The more secure we feel (financially and otherwise) the less dependent we are on love of Jesus. I don’t wish bad on anyone… but I do hope we (as Christians) continue to increase our dependency on Christ the same way those lepers did… only without the leprosy. Or maybe like those pilgrims in the Plymouth Colony who in spite of hardship still gave thanks to God for their first harvest of the land. They knew about dependency and didn’t let the circumstances of hardship over shadow their gratitude. Sometimes we are too comfortable or too insulated and our dependency on God suffers because there is zero desperation in our lives. We don’t want to give thanks to ourselves tomorrow taking credit for all we have done and how good things have been. No, tomorrow is the day to give thanks to the One who is the giver of all good gifts. Let us cling to Jesus… like a Samaritan who has been cured of leprosy.